It’s nearing winter time here in the great state of Wisconsin, and I still have a handful of butternut squash that I pulled from the garden weeks ago. Now don’t get me wrong here, but I am not the biggest fan of butternut squash. I really only grew it to make a couple of dishes for my wife, and to give some away to family and friends. This year I decided to make a stuffed butternut squash with some great local sausage, among other ingredients, and as I always walk by these squash I have in my kitchen, I knew I had to use them up, and hence when I remembered how much my wife loved a gnocchi I made here a few years ago. 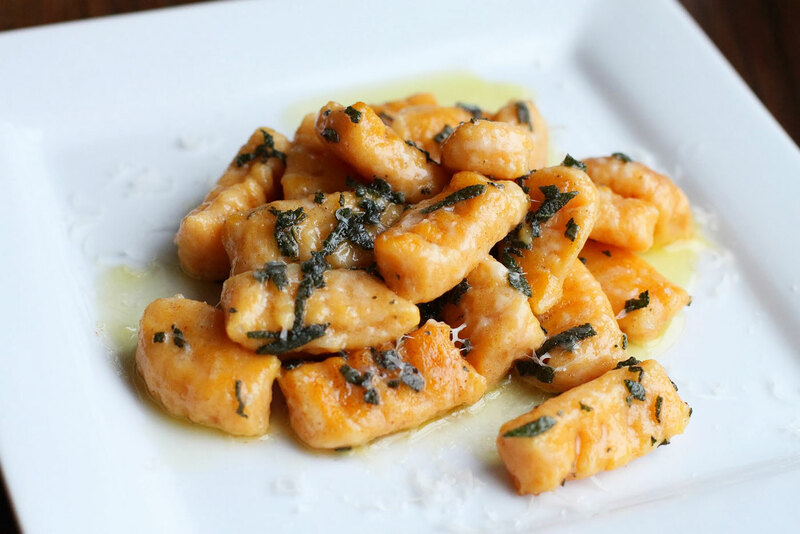 I knew this recipe idea would be a win for both of us; she loves gnocchi and butternut squash, and I was able to use up the squash, while at the same time use up some fresh sage I had growing in the garden. If you have never had gnocchi, it is a must to try. Gnocchi is basically a thick, soft pasta, often served in a light sauce. This recipe will uses a few steps in order to get the dough together, as well as a bit of time to roll out the dough into gnocchi, however it is all worth it. Start by preheating over oven to 425 degrees. Take a knife and make score marks into the flesh of the squash, about 1/2 inch down. Rub the skin with the canola oil, and place the squash onto a baking sheet, skin side up. Roast in the oven for 45 minutes. During this time, fill a pot with the potatoes, and cover with cold water. Bring to a simmer on the stove, and cook until fork tender. Once the potatoes are tender, drain, and return the potatoes back onto the stove on medium-low heat until the excess moisture is removed, just a couple of minutes. Remove and let cool. Remove the tender squash from the oven and let that cool. Once the potatoes have cooled, put them through a ricer if you have one, if not, mash them into a mixing bowl. Remove the squash from the skin and add them into a food processor. Process until you have a nice puree. Add this puree into a pot on the stove, and cook on medium heat for about 5 minutes to remove any excess moisture. Let cool, then add into the mixing bowl with the potatoes. To the mixing bowl add the egg, salt, and the parmesan cheese. Start your mixer, and gradually add in the flour. You do not want to dump in all of the flour, but just enough to that it forms a dough, a non sticky dough. I do this in my KitchenAid stand mixer with a dough hook, allowing me to knead for a few minutes after the dough has came together. Once the dough is kneaded, lightly flour your work surface, and add the dough onto it. Divide the dough into equal pieces, about 8 will work. Lightly flour a large baking tray as well. Take each small ball of dough and gently roll into a rope shape, about one inch thick. Once you have your rope, cut into one inch pieces. Using the back of a fork, roll into a gnocchi shape, then place onto the baking sheet. Repeat until all of the gnocchi have formed. Lightly cover with plastic wrap and place into your refrigerator to set up, about 2 hours. Once you are ready to make the gnocchi, bring a large pot of salted water to a rolling boil. During this time, slowly melt the butter in a skillet. You are going to go for a browned butter on this sauce, so keep that in mind. We will raise the heat a bit as the gnocchi gets closer to finishing cooking. Once the water is rapidly boiling, add in about 15-20 of the gnocchi. Give a gentle stir, and cook for about 10-15 minutes, or until the gnocchi are floating to the top. As soon as they begin to float to the top, raise the heat of your butter to a medium-high heat, and let hte butter begin to brown. Once the butter begins to brown, toss in the sage. It will crack and sizzle, and smell really, really good. If you have never had browned butter sage sauce, well, you will love it. Two of my kids really love it, and that is saying something. Remove the gnocchi with a slotted spoon and add into the butter sauce. Give a gentle toss, and let this cook for a couple of minutes. Add more grated parmesan to your liking, and serve. Repeat if you are serving more than two people, otherwise, you can place the baking pan into your freezer and flash freeze the leftover gnocchi (that’s what I did) for later use. 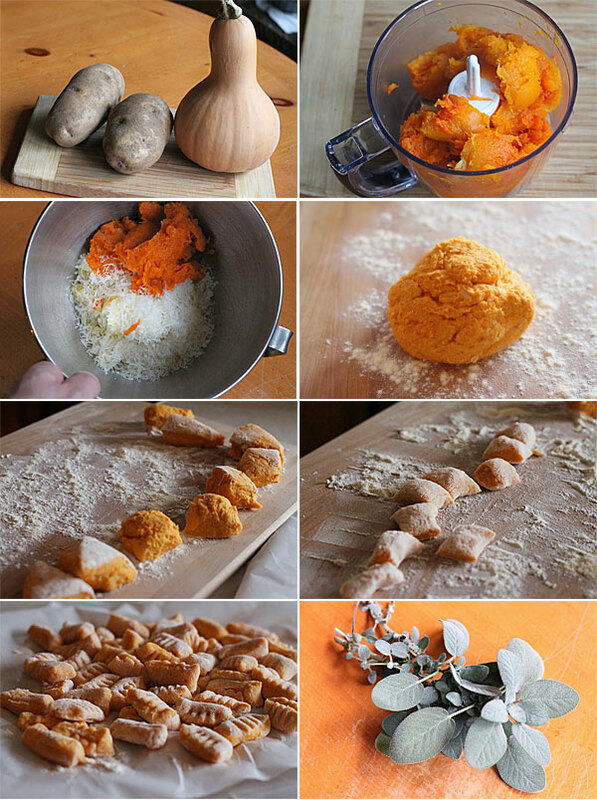 Not only does this particular butternut squash gnocchi look awesome with that light orange color, but it tastes like Fall as my wife had noted. Fluffy and soft pillows of pasta that have that light, not overwhelming, flavor of butternut squash, is perfectly balanced by that browned butter sage sauce. This is good, REALLY, REALLY good. I hope you enjoy. Start by preheating over oven to 425 degrees. Take a knife and make score marks into the flesh of the squash, about ½ inch down. Rub the skin with the canola oil, and place the squash onto a baking sheet, skin side up. Roast in the oven for 45 minutes. The time on this recipe really should be altered. If it needs 45 min to bake squash and 2 hours to set there is no way this only takes 1h20min to make. Thanks Jasmine… most likely an error on my part. I’ll take a look at the times and adjust. Glad you liked it though!